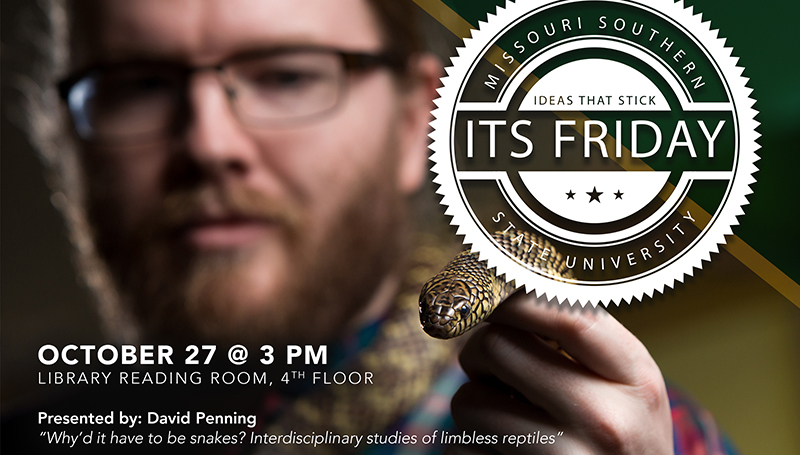 Dr. David Penning, from the Department of Biology & Environmental Health, will present “Why’d It Have to be Snakes? Interdisciplinary Studies of Limbless Reptiles” during the next ITS Friday session from 3 to 5 p.m. Friday, Oct. 27, in the Spiva Library reading room (4th floor). The Ideas That Stick presentations encourage the campus to come together for a free exchange of ideas. All members of the faculty and staff are invited. No RSVP is necessary; refreshments will be provided. PreviousThe Game Plan: There is still time to catch up.